These days, 3D printing is never far from the public eye. Its vast and imaginative array of applications is constantly growing, from life-saving medical implants to life-ending firearms. Now, architects and structural engineers have started experimenting with the technology in an effort to, quite literally, change the world we live in. There’s no denying that 3D printing holds great potential for larger-scale projects such as buildings and bridges. It could realise complex shapes that would be unachievable using standard building techniques. It could modify existing structures, for example by putting more insulation onto outer walls, or more strength into stairwells. Taken to the extreme, a building could be printed with all its plumbing, pipework and electrical wiring already in place. It sounds exciting. But let’s set the hype aside for a moment, to consider what 3D printing can actually achieve right now. So far, the technology has two outstanding features: it can manipulate a range of materials, and it can help to reduce waste. While the cheaper, basic machines are limited to plastics, more complex 3D printers can fuse powdered raw materials such as gypsum (like chalk dust), metal powder (like steel) or polymers (nylon) into complete objects. In much the same way that a 2D printer can produce a whole spectrum of colours by mixing different proportions of cyan, magenta and yellow ink, advanced 3D printers can combine two or more materials to alter the physical properties of printed objects: from colour, to strength, to electrical conductivity and even thermal insulation. These advanced printers work by sprinkling powdered materials onto the print area layer by layer, fusing the particles of each layer together according to a given design. When the print is finished, excess powder can simply be shaken off and reused, leaving only the fused material in the desired shape. This is much more efficient than the standard practice of cutting away at a large block of material until you have the shape you want. But the technology does have its limitiations: for architects and engineers, the main stumbling block to date has been size. As a general rule, a printed object must be smaller than the machine that prints it. Not to be thwarted, architects and engineers have been coming up with inventive ways to solve this problem. Some of the latest and greatest ideas were on show at a major symposium, which I presented at last summer. There were two fascinating presentations, for example, by engineering firm Arup. They created a 3D printing process which joins steel tubes together, using only a quarter of the material of the standard process. Meanwhile, at the 3D Print Canal House project, technologists were tackling the size problem head on. They scaled up existing technology to create a 6m high 3D printer, capable of producing plastic wall panels with very complex shapes, which are then filled with concrete for structural strength. By contrast, Chinese firm WinSun developed a very large printer which uses liquid concrete to produce full-size, 3D-printed building panels that can be assembled into a finished structure. Dutch firm MX3d have managed to get even closer to printing an entire structure in one piece: the team there have developed a 3D printing robotic arm, which extrudes molten steel that quickly cools and solidifies, in a similar manner to the fun, plastic 3D printing pen toys available on the market. Since the robot can move around on rails, or even on the structure itself, it can 3D print in the open air. The firm hopes to print a steel pedestrian bridge over an Amsterdam canal, but they are yet to find a site. My colleagues at the University of Bath are involved in an even more ambitious project alongside others to develop automated, flying, 3D printing drones. These will be able to 3D print buildings, without the constraint of being anchored to the ground. Despite all these developments, a few obstacles remain. Constructing buildings and 3D printing both require materials with particular properties – and these requirements don’t always overlap. For example, concrete seems like an obvious choice for 3D-printed architecture, since it can be transported as a liquid and sets very hard. 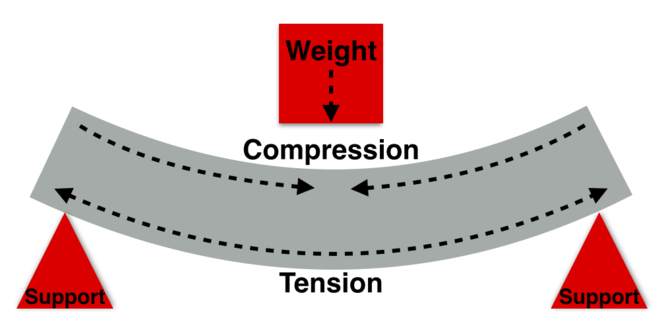 But while concrete is strong in resisting compression (being squashed), it does not work well when in tension (being pulled). Concrete floors generally have steel reinforcement bars in their lower face, to resist the tension that’s caused by bending. So 3D printing with concrete will not be effective, unless we can find a way to improve its resistance to tension. Bent floor stretches the bottom face and squashes the top face. At the moment, research in this field is focused on introducing small fibres into liquid concrete, to provide some tensile strength without compromising its ability to flow through 3D printing machinery. Others are looking at ways to automatically “print” the reinforcing bars within the concrete. What’s more, there’s still a lot we don’t know about the structural strength of the 3D printed objects – in particular, the effect of building up a solid object from fine layers. This information is critical if we’re to have confidence in the ability of 3D-printed buildings to withstand both everyday use, and extreme conditions such as earthquakes or storms. I have just started work on a project which aims to do just that, with a view to building a mathematical model of how different layering, direction and speed of printing affects the final strength of the object. This will allow structural engineers to understand and adapt their designs to suit the specifications of 3D-printed buildings, when they do eventually come along. But it’s important to ensure that 3D printing doesn’t just become a solution looking for a problem. It doesn’t take an ornate, steel-welding robot to build an environmentally sustainable bridge, when it could be constructed with simple wooden planks. While 3D printing will no doubt become a valuable tool in the architect’s arsenal, we need to wield it carefully.